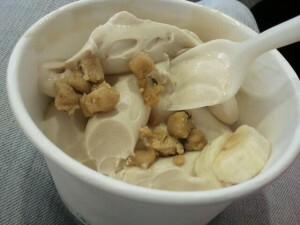 Ok. I’m an avid frozen yogurt fan- and so far, this is one of the best places I have ever been to. I’ve been there a few times, and decided it needs a review on this website for all of you to hear about and perhaps go enjoy it, too! One word that comes to mind? AMAZING. Then, there was a topping bar, that had pretty much everything from fruity, to sweet, to crunchy. I saw cheesecake bites, cookie dough bites, brownie bites, mango, lychee, bananas, and so much more. I went for cookie dough bites and banana this time. Here’s what my cup of deliciousness looked like. yea... i ate some before I took the picture. I always forget to take the picture, THEN eat!!! Then, they weighed my cup, I paid, and enjoyed! The peanut butter flavor was phenomenal. Super creamy, sweet, and savory at the same time. Literally, I wish I could buy this by the gallon. I think it was almost exactly like soft serve ice cream in consistency. In fact, if you told me it was ice cream, I would have believed you! The cookie dough was also delicious. Just like the cookie dough that comes in ice cream tastes. Soft, sweet, buttery and just perfect. 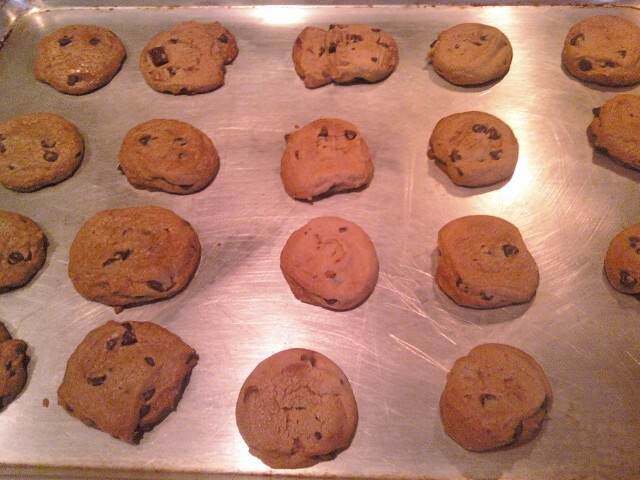 I saved all of mine for the end and ate them all ate once- a cookie dough blob, I guess you could call it. And lastly, the banana slices, fresh and mildly sweet. Sort of like when I eat a banana that’s perfectly yellow with no brown spots- it’s sweet, but not super sweet, and still has a good amount of firmness to it. Overall, do I recommend this place? (is that a serious question?) Of course I do!!! I would give it 4 1/2 stars. Some of the yogurt is a bit high in sugar, but I love the idea of this place. You get to choose exactly what you want! Have you ever been to 16 Handles? What’s your favorite flavor and/or toppings? Need a little extra protein in your day? Well I think I have a tasty solution for you guys, made by Luna! Overall, these are good. They certainly were satisfying, and quenched my appetite, especially after a hard kickboxing workout. I liked that they are covered with delicious chocolate, low glycemic, and packed with protein and provide important vitamins and minerals like calcium. What I didn’t like was that they are a bit high in saturated fat (3.5- 4 grams), and also a bit high in sugar. However, if you like protein bars and crave some sweetness, I would definitely give these a try! 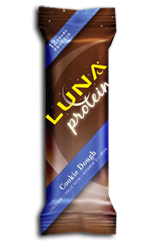 Cookie Dough– 1 bar is 180 calories, 6 grams of fat, 21 carbohydrates, 3 grams of fiber, 15 grams of sugar and 12 grams of protein. 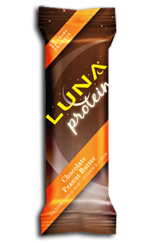 Protein Blend (Soy Protein Isolate, Whey Protein Concentrate), Organic Evaporated Cane Juice, Coating (Organic Evaporated Cane Juice, Palm Kernel Oil, Cocoa, Soy Lecithin and Organic Vanilla Extract), Chocolate Chips (Evaporated Cane Juice, Unsweetened Chocolate, Cocoa Butter, Soy Lecithin, Natural Flavors), Inulin (Chicory Extract), Glycerine, Macadamia Nut Butter, Cocoa Soy Rice Crisps (Soy Protein Isolate, Organic Rice Flour, Organic Alkalized Cocoa, Alkalized Cocoa), Natural Flavors, Salt, Soy Lecithin. Chocolate Peanut Butter-1 bar is 190 calories, 9 grams of fat, 19 carbohydrates, 3 grams of fiber, 13 grams of sugar and 12 grams of protein. 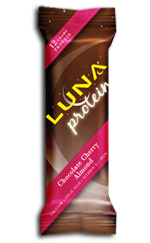 Cherry Chocolate Almond-1 bar is 180 calories, 7 grams of fat, 21 carbohydrates, 3 grams of fiber, 15 grams of sugar and 12 grams of protein. Protein Blend (Soy Protein Isolate, Whey Protein Concentrate), Organic Evaporated Cane Juice, Coating (Organic Evaporated Cane Juice, Palm Kernel Oil, Cocoa, Soy Lecithin and Organic Vanilla Extract), Inulin (Chicory Extract), Almonds, Glycerine, Macadamia Nut Butter, Dried Cherries, Soy Rice Crisps (Soy Protein Isolate, Rice Flour, Barley Malt Extract), Natural Flavor, Salt, Soy Lecithin. 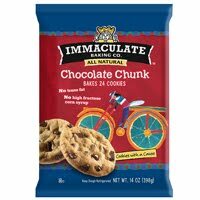 Immaculate Baking Company is a great company that produces all natural & organic cookies, brownies and other treats. They also produce all natural and organic doughs for you to bake your own goodies! The company sent me a coupon for a free product to try, so I picked up the natural Chocolate Chunk cookie dough. It was 24 pre-cut squares of dough, that all you had to do was set your oven to 350 degrees F, separate, place & bake for 10-14 minutes. Easy, enough, no? Well today I was craving some chocolate chippers, so I pulled my pre-made dough out of the fridge. Each dough ball was round in shape, thick, and only about an inch and a half in diameter. There weren’t really chocolate chunks per se, more like your standard chocolate chips. I reccommend letting them thaw a few minutes before separating, as a few of my pieces broke in half as I tried to separate each ball. One thing that was weird is that you can fit 20 of them on a pan, which leaves you with 4 left over (at least with the pan I used). I ended up just throwing the other 4 out because I couldn’t be bothered to wait 15 mintues for 4 cookies. When they were done baking, they turned a nice golden brown, but didn’t really spread out much at all. They were small! Overall, these get 4 stars. They are tasty, but they are TINY!! The positives is that they are all natural, have no trans fats, and the company promotes “Cookies With a Cause”. This particular brand gives back to others, sucha s donating to charities or art supplies. Nice! The negatives however, is that there is NO fiber (made with unbleached wheat flour), has 2 grams of saturated fat per tiny cookie, and contain palm oil, one of the rather unhealthy oils. 1 cookie is 80 calories, 3.5 grams of fat, 11 carbohyrates, 0 grams of fiber and 1 gram of protein. Unbleached, Unbromated Flour (wheat flour, malted barley flour, niacin, reduced iron, thiamine mononitrate, riboflavin, folic acid), Chocolate Chips ( sugar, chocolate liquor, cocoa butter, soya lecithin, vanilla extract, ground cocoa beans), Light Brown Sugar, Palm Oil, Whole Eggs, Sugar, Invert Cane Sugar, Chocolate Chunks (sugar, chocolate liquor, cocoa butter, chocolate liquor processed with alkali, soya lecithin, salt), vanilla, water, sea salt, baking soda, baking powder. dont forget about my giveaway to win some CHEESE PUFFS over here! !